lack of water. Access to freshwater around the world is increasingly becoming a problem as more and more people don't have access to enough of it. The number is growing daily. 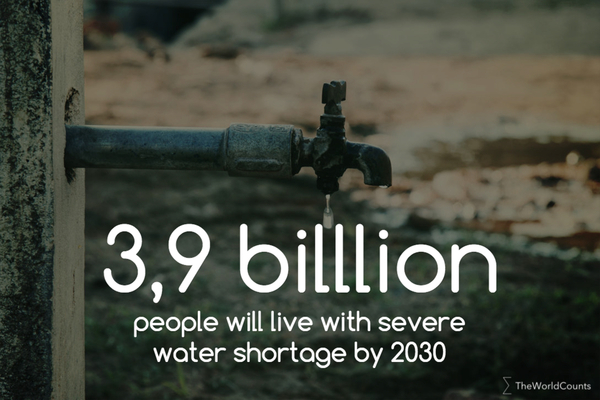 By 2030, nearly half of the world's population (3.9 billion people) are expected to be living in areas under severe lack of water. This is an increase of more than 1 billion people from today. As one 10 year old child puts it: “Of course I wish I were in school. I want to learn to read and write. But how can I? My mother needs me to get water”. Yeni Bazan, El Alto, Bolivia. The highest prices for water are often paid by poor people who do not have direct access to water. In some cases, prices can be 500 times higher than what is paid by people who have direct connection to their houses. Globally, there is actually enough water to meet everyone's needs. But water is not distributed equally around the planet, and this creates problems - especially in some of the world's poorer countries. Most of the world's freshwater is used by agriculture (70 percent). Because of ineffective irrigation methods, overuse of water is a huge problem in agriculture - half of the water used may actually never reach the crops. An estimated 3.9 billion people (47 percent of the world population) are expected to be living in areas with high water stress by 2030, mostly in non-OECD countries. Interested in more facts like the people in need of water? Then plug in and subscribe to our newsletter.